We are back for our final day of organization. 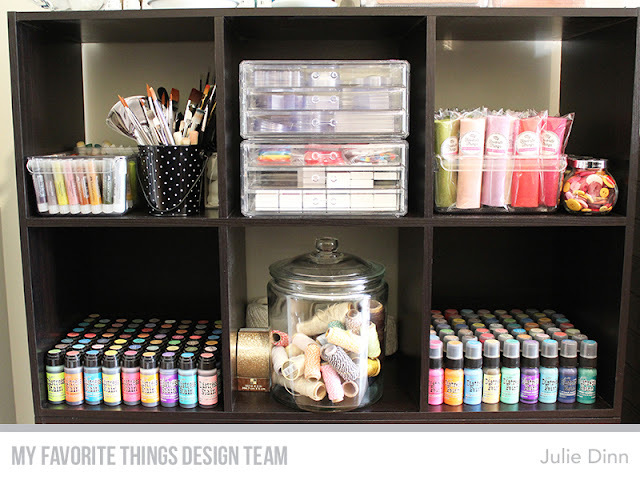 I hope you have been inspired and have found some ideas that you can implement in your crafty space. 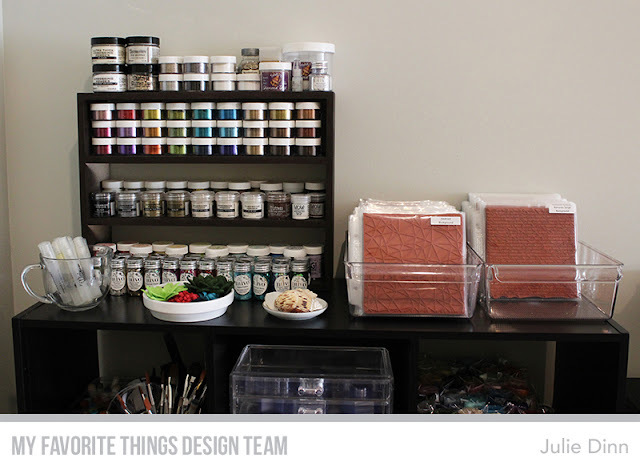 On our final day, I thought I would give you a quick look at the two main walls in my craft area, so you could see an overview of where everything I have shared over the past few days is located in the room. This wall houses my stamping desk, a couple of Expedit shelves, my photobox, and my cutting desk. 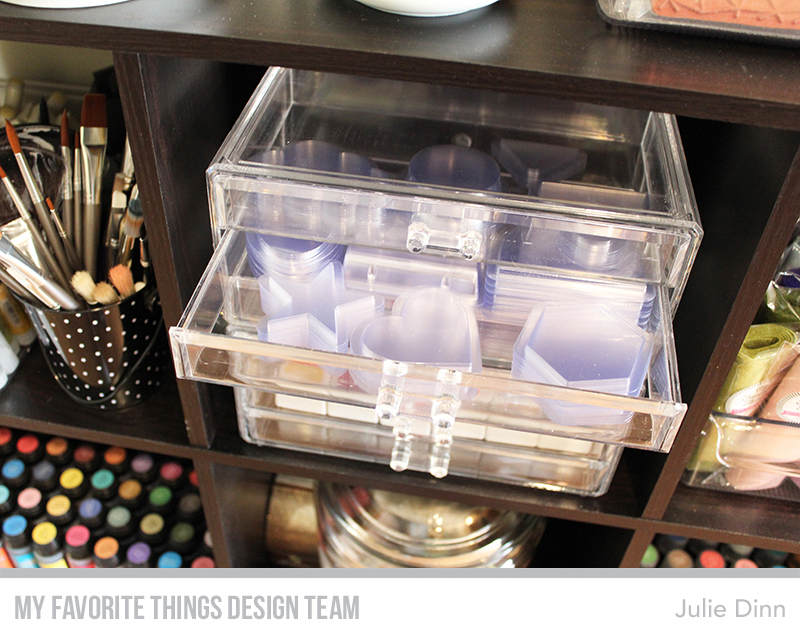 The opposite wall houses my paper organizers, stamp & die storage, and a shelving unit full of all sorts of goodies that I am going to share with you today. The other end of my office, that is not pictured, houses my work desk, a tv, and a chaise lounge for Mr Tibbs. 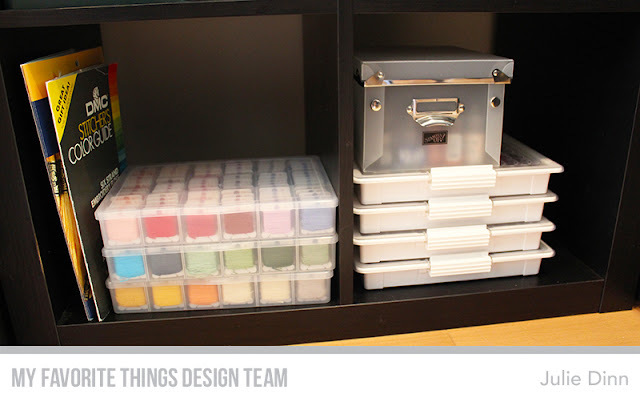 This little shelving unit replaced the Ikea cart that I used to call my color cart. I store all sorts of paints, powders, and tools here. 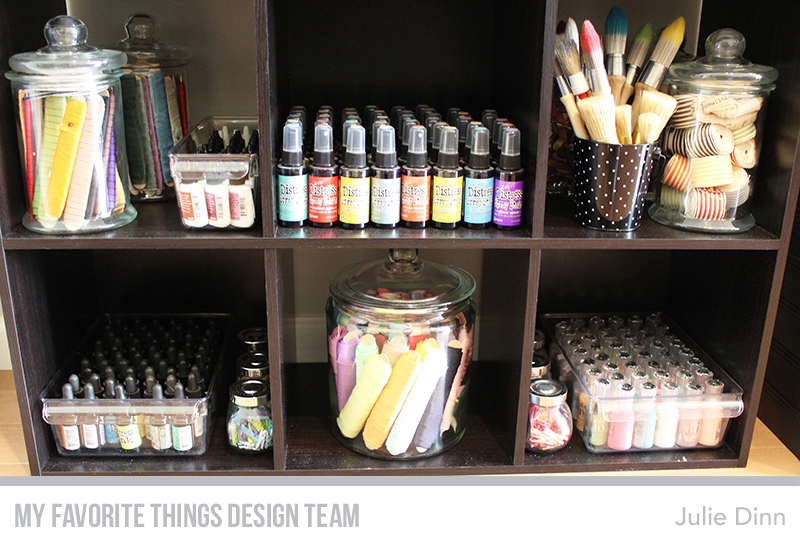 On the top of the unit I store all my glitters, embossing poders and some of my large jars of sequins. My stencils and backgrounds are also stored here. 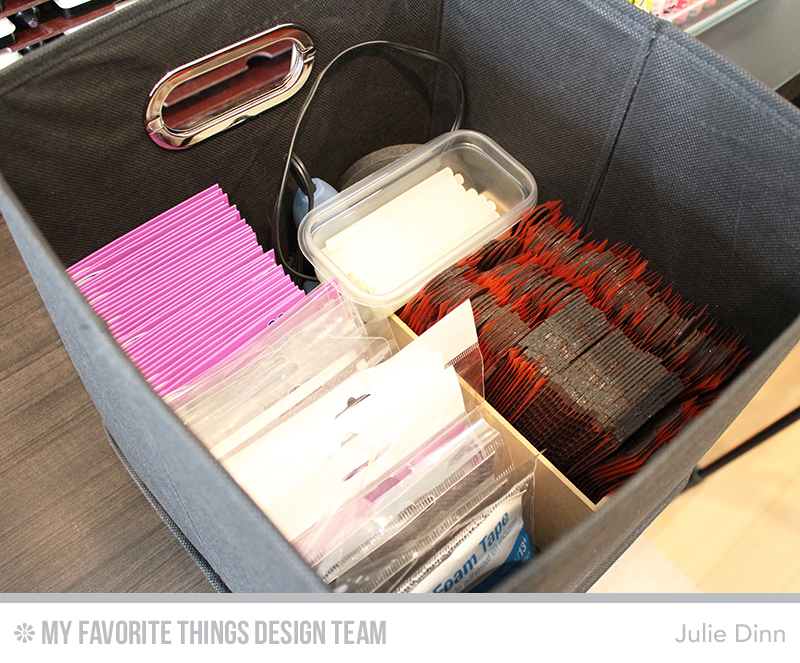 Both items are stored in labelled 6x6 Paper Protectors, sitting in InterDesign Linus Bins. Here is a closer look at the top two shelves. 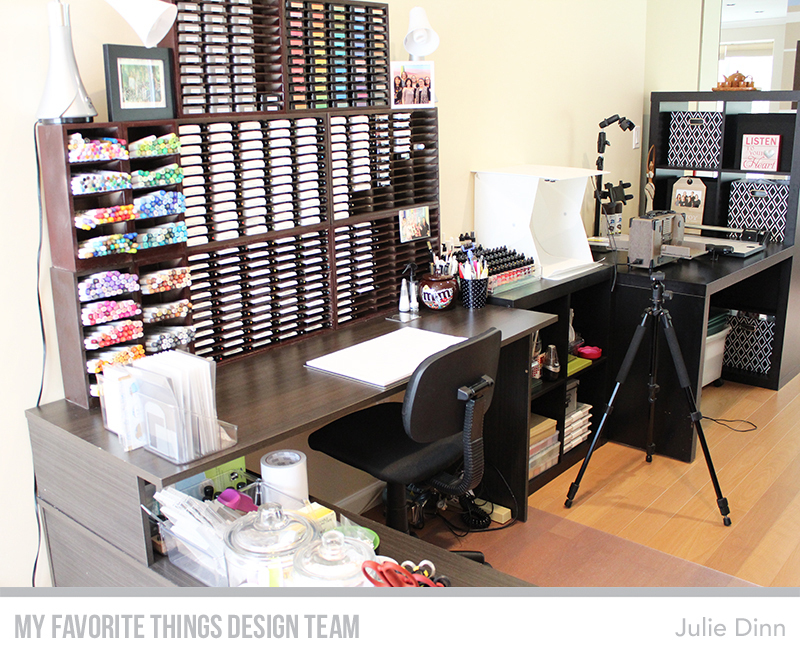 Here you will find Gelatos, brushes, tools, twine, Distress Paints and Stains, felt, buttons, and shaker pouches. 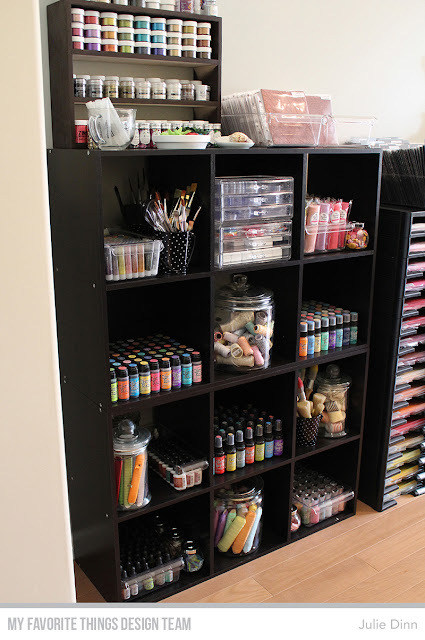 The bottom two shelves contain Distress Spray, Color Burst, Distress Refills, Nuvo Drops, ribbon, and stencil brushes. 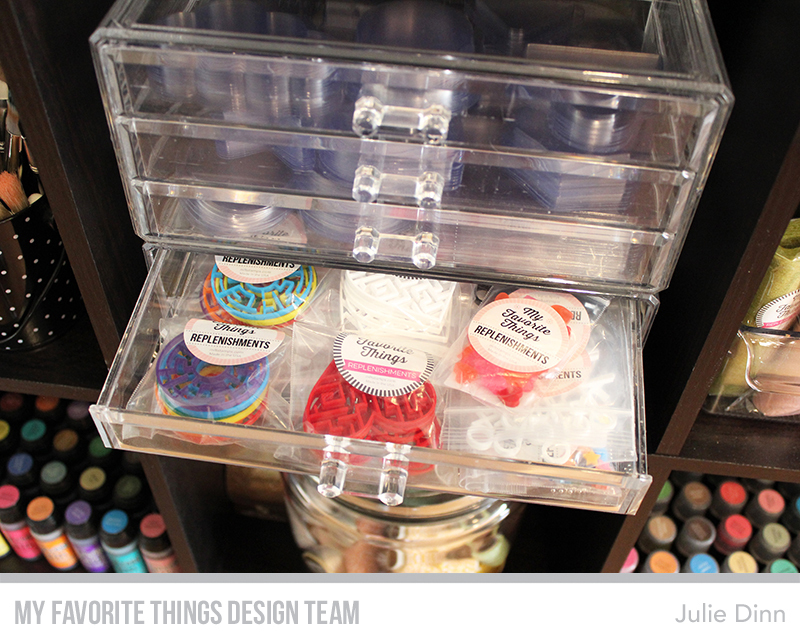 You may have noticed the clear drawers in the top center compartment. These drawers are filled with all my shaker pouches. They fit just perfectly in here. 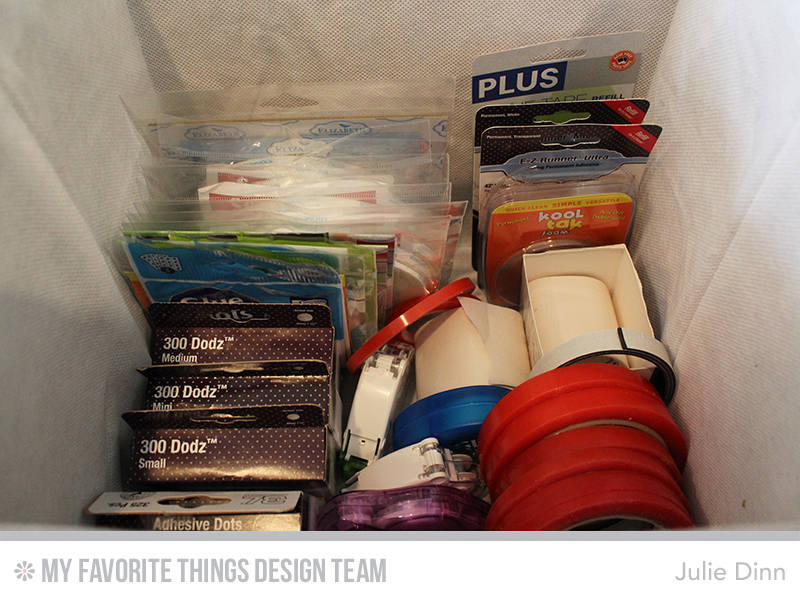 I also store all my MFT mazes, slider elements, and other replenishments in here. Throughout the room I have eight of these black and white polka dot tins. I beleive I bought them at Target. I've had them for years and I LOVE them. 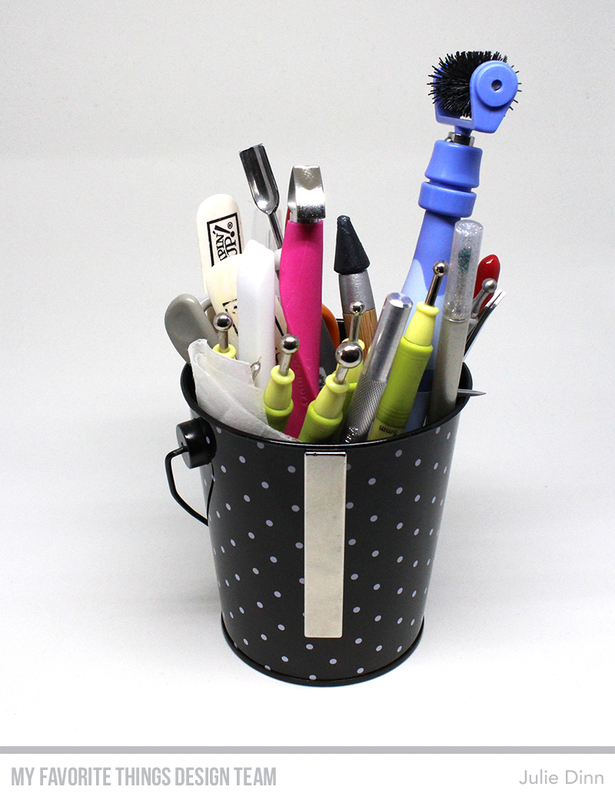 Each one is filled with a type of tool or brush. 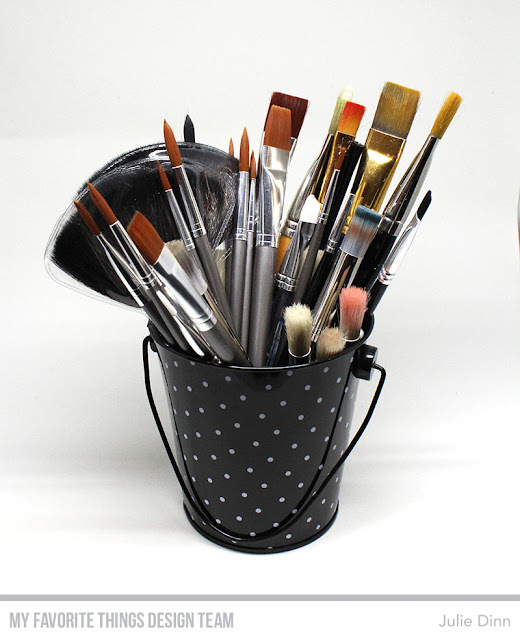 The one below is full of paint brushes. I have a little Expedit unit that sits beside my desk. 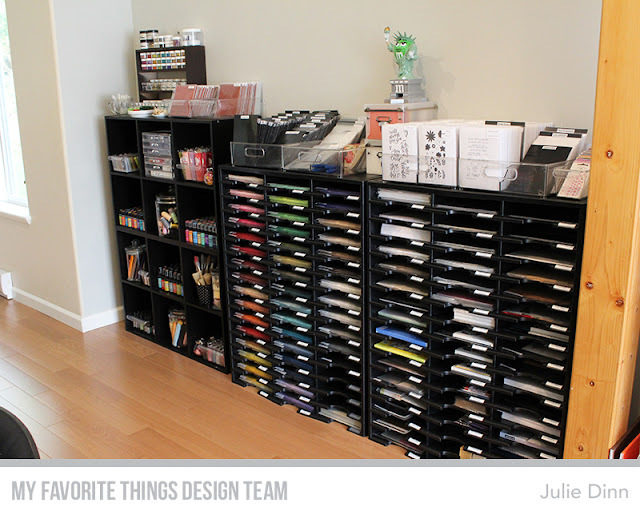 The top shelves are filled with watercolors and pencils. 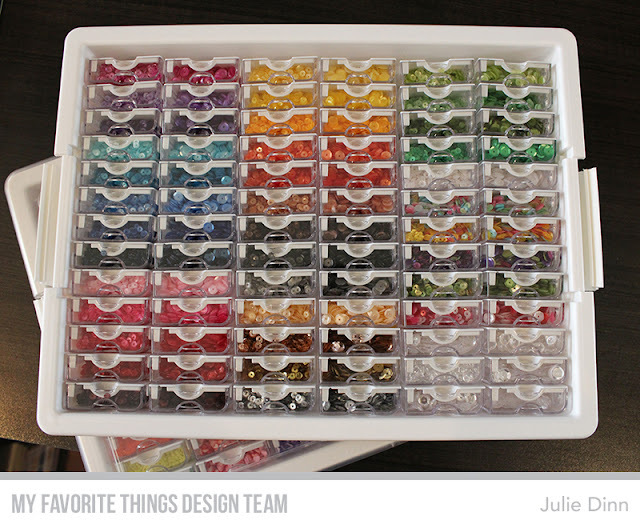 The bottom sections are filled with all sorts of embellishements and floss. I use these containers to store my floss. 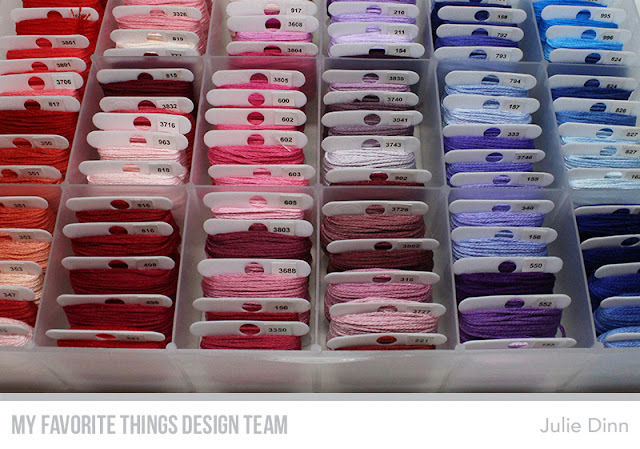 I usually buy two of each color when I purchase DMC Floss. I wind them on these little plastic bobbins. I use DMC labels for my floss. They are adhesive backed, but the adhesive is not very strong, so I adhere them with Extreme Double Sided Tape. I have three full containters now, with a fourth one on the way to hold the overflow that I currently have sitting in a box. The other side of the shelf is filled with four of these AMAZING Bead Storage Trays. I can't tell you just how much I love these trays. It is so much easier to see exactly what you have, and everything has it's own sopt. This top one is full of Pretty Pink Posh Sequins. I store the 4mm and 6mm sequins side by side. My stamp desk is a weird L shaped desk, the part that sticks out isn't desk space, it is storage space, that was probably meant for a printer. 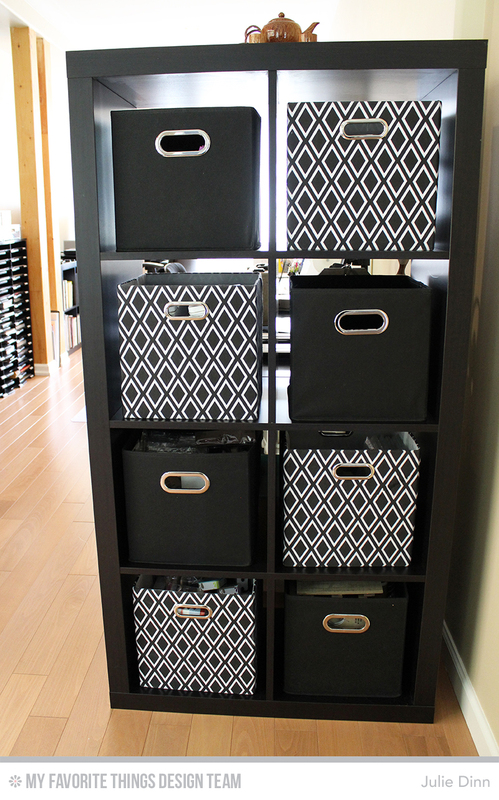 It is a great spot for extra storage. 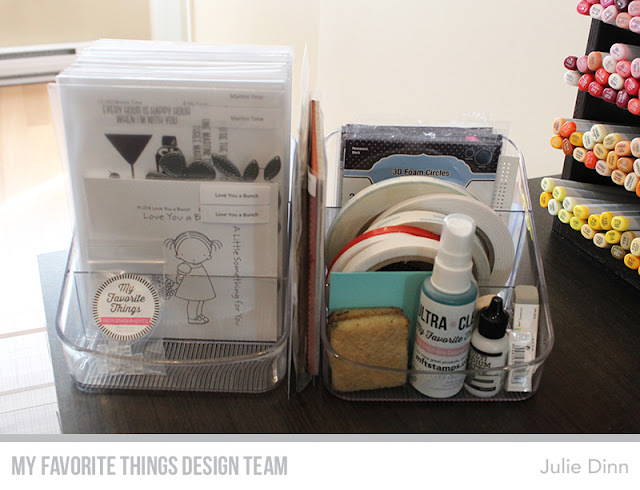 On the top of this piece, I have all my scissors, stamp blocks, Post It Tape, and stamp cloths. The shelf underneath houses my MISTIs, Mini MISTIs, and Scor-Buddy. I also have a bin full of Blending Tools. I really need to find a better way to organize these, I'm hoping to get some ideas from the team this week! The shelf underneath is where I store my patterend paper. I have a couple of clear holders on my desk that hold the current MFT release and my most used adhesives. 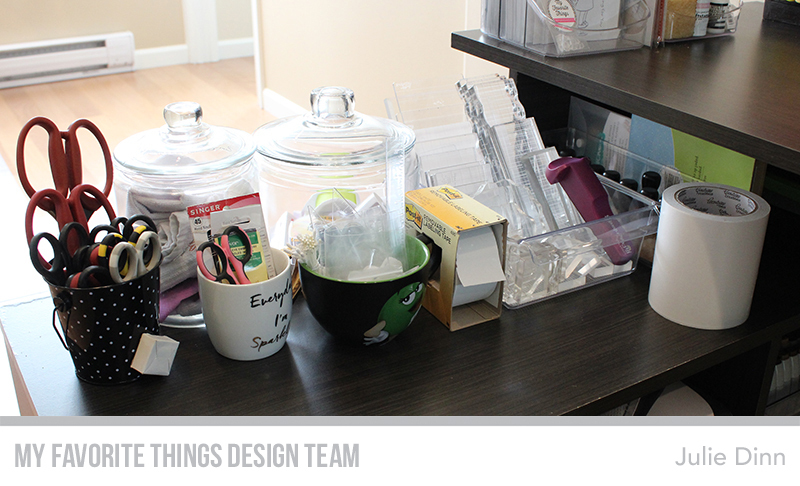 I like to have all of this right on the desk for easy access. 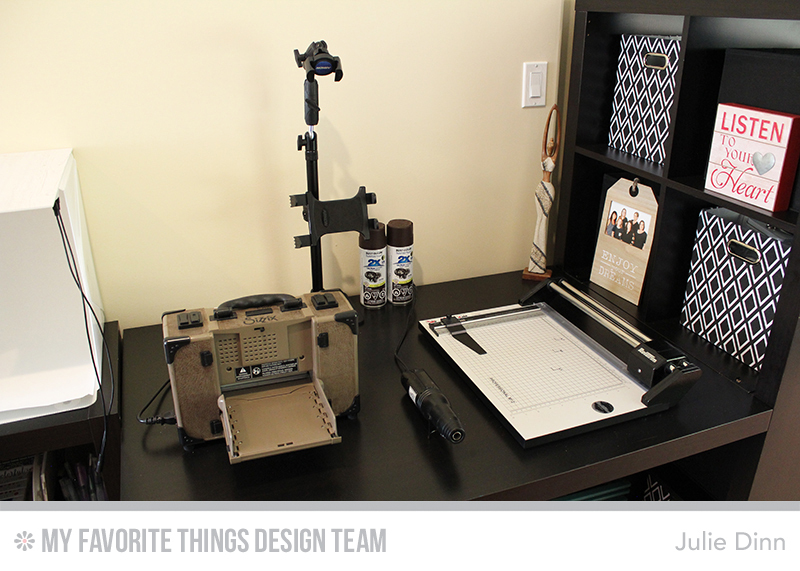 My cutting table holds a few of my favorite tools, my Vagabond and my Rotatrim Trimmer. I've gone through a few Vagabonds over the past few years, but I am still on the original Rotatrim. I have had it for at least 10 years and it still works as well as it did the first day I used it. At the end of my room I have an Expedit Unit filled with Fabric boxes. These boxes hold all sorts of goodies, like adhesives, mixed media products, and alterables. 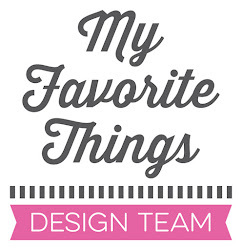 I also have a bunch of Tim Holtz stamps, dies and embellishments tucked away here. Herre is a quick peek inside of my adhesive boxes. As you can see, I don't like to fun out of tape. 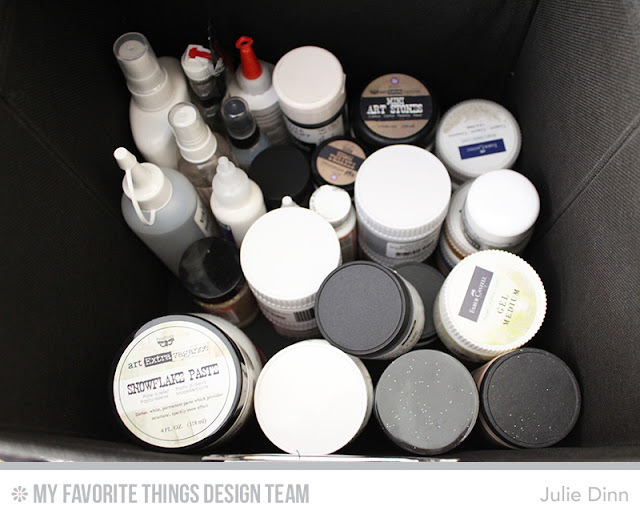 This one is full of different pastes, glazes and other goodies. I hope you have enjoyed this look into my space this week. 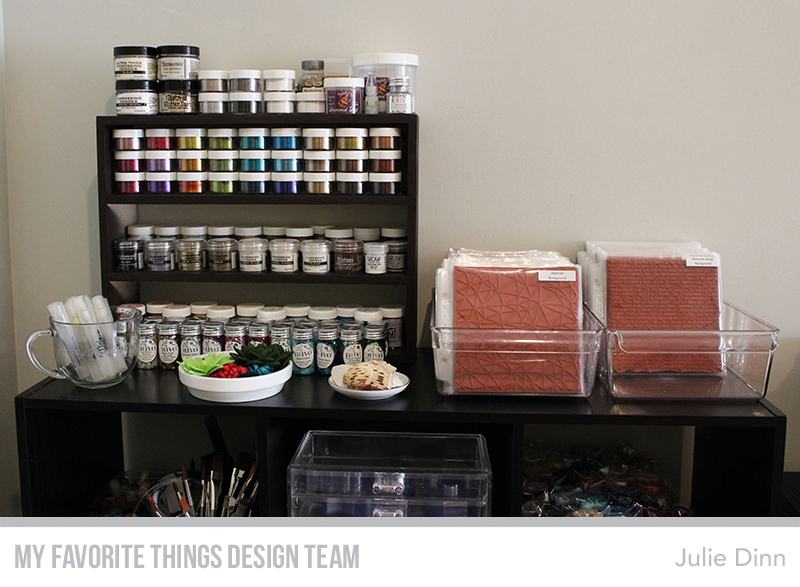 There are some things that are still a work in progress, but overall I love my craft area. 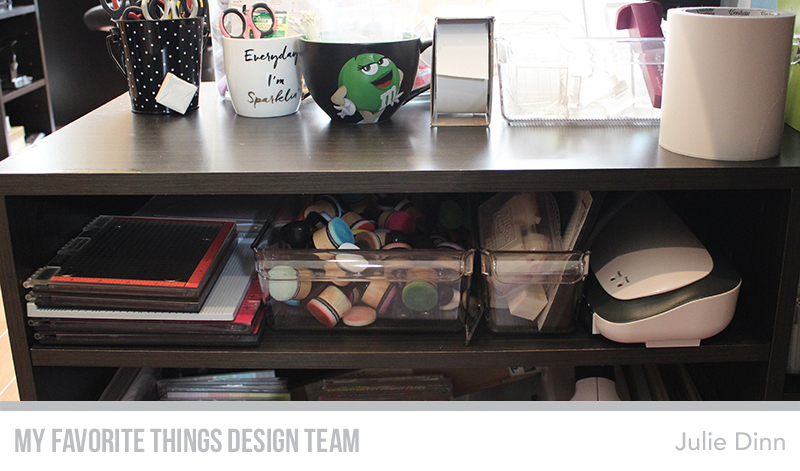 Be sure to check out the MFT Blog to see how the rest of the team organizes their goodies. Thanks for the quick tour of your room. I love to see the big picture of how all the little pieces fit in. 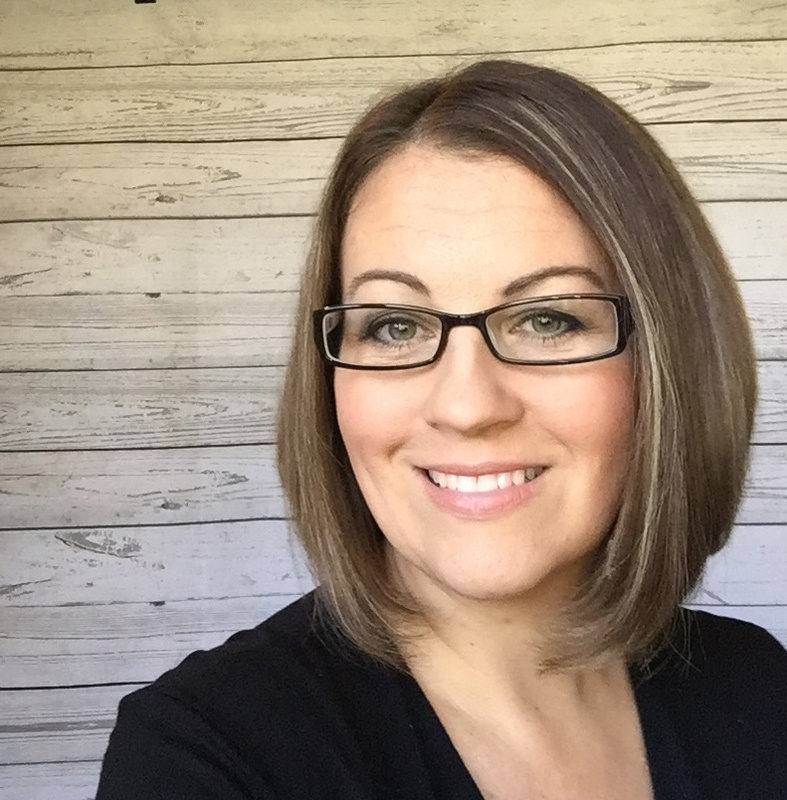 Love many of your organization ideas. Thanks for sharing.